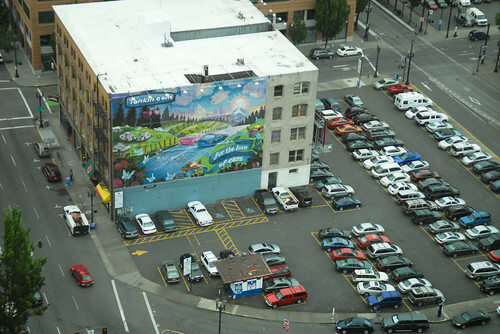 It’s truly amazing what we sacrifice “for the love of cars” as this advertising mural in downtown Portland says. Auto parking is in a major state of flux right now. Our city is in the middle of major reform to its parking policies with an eye toward weening people off free and abundant storage of their motor vehicles, while at the same time we are still investing millions into huge parking garages in the central city. For people who care about great cities and quality public spaces, the time is now to get educated and engaged about this issue. 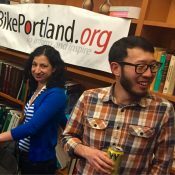 — We’ll get you updated on the City of Portland Bureau of Transportation’s latest policies, projects and plans (and tell you how you can impact them). — You’ll hear from citizen activist and Portland Planning Commissioner Chris Smith about his recent work to convince the city to not create parking minimums in northwest. — We’ll introduce you to the people behind the Portland Shoupistas, a group that’s pushing to make sure PBOT’s adopts the most progressive parking policies possible. — We’ll hear from urbanist/economist Joe Cortright who just published an illuminating article on parking in City Observatory. — You’ll get a behind-the-scenes look at how local company (and event sponsor) Lancaster Engineering is revolutionizing parking analysis for cities around the country. And of course like always we’ll let everyone who shows up share their questions and insights, all while snacking on great bites and drinks from our sponsors Widmer Brothers Brewing and Green Zebra Grocery. It happens next Tuesday at Lancaster Engineering HQ, 321 SW 4th Ave, 4th Floor. Doors open at 6:00 and we’ll get things started at 6:30. Here’s the event page and it’s on Facebook too. Hope to see you there! Garages are good right? Stack the cars up rather than have them all spread out? If the private sector wants to build, them, maybe. URA money that could build housing for people shouldn’t be spent on housing for cars. This is exactly the same dead-end, zero sum logic we here fall back on when it comes to people & housing too: density vs sprawl. Like these are the only two options. No. Let’s talk about enough, too much, reining it in. I see what you’re getting at but I don’t think it’s an either/or. We can still strive for less cars in the world and use urban space much more efficiently in the meantime. Theoretically, sure, but in the case of growth (of people, houses, demand for X and Y) that is not presently the case. With parking, it could be, but your framing of the issue did not include any mention of too much, of limits, of the need to look at this wholistically. Well, it was an comment on the internet. This is a viewpoint I’ve come around to with parking. Parking isn’t necessarily smart just because you charge for it. The roads can only fit so many cars, and congested roadways have negative impacts beyond people that drive. For example, if cars are stuck in congestion and bikes aren’t, drivers try to make turns through apparent gaps in traffic and hit cyclists and pedestrian (I’ve witnessed a couple collisions like this, and several near-misses). For another, backed-up traffic often delays mass transit. Finally, new garage entrances on urban streets create new places where vehicles cut across and block the sidewalk, making walking more dangerous, less pleasant, and less convenient (same goes for biking where there are bike lanes). Parking fees high enough to ensure some availability (a common “smart parking” strategy) only solves one problem on one block, and the negative impacts of too much parking in a neighborhood or a city apply more widely. The only way out is to cap the total number of spaces. The thing that must be capped most urgently is the number of spaces available to office workers in congested areas, since each additional space available to an office workers equates to one more car on the road during each daily rush hour. In areas that are already congested during these times of day the cap clearly must be set below the current level of availability. 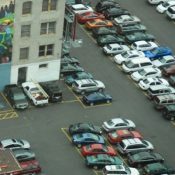 Lot operators would then bid on the right to operate parking spaces, up to the limit. the OHSU parking spot is for patients and RV parking for family members of people undergoing non-ambulatory surgery and cancer treatment at the new Knight oncology center. yeah, lets attack the needs of the families of societies most vulnerable, right? The vast majority (over 400) of the spaces being built at the new OHSU garage are for the use of staff. and its a single block from the year-round bike valet. mixed use patient/employee parking just like the current underground garage. There are certainly a large number of people who drive to any particular medical facility who could either take another mode or pay for parking when they are there. Hospitals can very easily validate or pay for alternative transportation for those who need it. But you know who is truly vulnerable? The family who can’t afford a car and needs medical treatment and has to travel on an underfunded transit system and walk on streets that are unsafe because we cater, almost entirely, to car travel. um, OK. we’re talking about parking spaces however. This is probably an ironic question, given the topic: Is there somewhere near this event where I can securely park my bicycle? I’m very reluctant to leave it untended for a few hours locked to one of the downtown staples. I’m not sure about “secure” bike parking, but if there’s nothing that suits your hopes maybe use two u-locks? FWIW I’ve parked all over downtown and PSU countless times, sometimes overnight, for 1.5 years and my bike has yet to be stolen. Most thefts involve cable locks or cheap chains. Theft is bad in Portland, and the Lancaster office certainly isn’t in a low-theft area, but imo the theft problem in Portland is blown way out of proportion. I’ll lock my bike up anywhere in Portland over locking up in NYC or San Francisco, just to name a couple cities that have worse theft problems. It kills me that the hysteria over theft causes people to be so anxious and sometimes avoid biking. This fear seems to be worse in Portland than in any other city. Maybe get a beater bike for certain occasions if the fear is so persistent? Biking should be care-free, including leaving a bike locked to a staple rack. P.S. If you’re worried about thieves cutting through the staple rack, or lifting the rack out of the ground, feeding your lock through your wheel and frame makes this type of theft much less appealing as the thief wouldn’t be able to ride off with the bike. Thanks Gerald. My sentiments too. This kind of fear (and I have it, too) has to good for bike share. I’ll be using it probably exclusively for trips downtown. Why so reluctant to use a staple downtown? I lock up a very expensive bike every single day. I just use at least one very high quality lock. These days I’ve actually been using 2 locks. If you need one let me know and I’ll be happy to loan you one. I’ll even offer to lock up your bike to mine if it makes you feel better. Bike theft is reported in the news persistently. This excessive media attention is what makes people so afraid to leave their bikes locked up, imo. It’s kind of like how parents stopped letting their kids play outside a generation ago after the 24/7 cable news media decided to persistently report on kidnappings, etc. 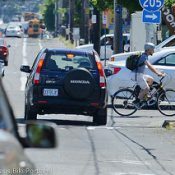 I will admit that Portland’s bike theft problem has gotten much worse in the past decade (the statistics bare this out). However, when people’s thoughts become overwhelmed with the fear of theft they tend to bike less. I’d much rather the crack down on bike theft happen more behind the scenes within PPB, with only occasional media coverage. I want to be reminded of the positive aspects of biking, not the negative. I lived in Washington, DC for two years. The bike theft problem resembled Portland’s. However, it wasn’t discussed in the media nearly as much. As a result my friends generally biked wherever they felt like at whatever time. Sure, some of them had their bikes stolen, but they’re just bikes. Sometimes bikes even get stolen out of secure garages, so no method is fool-proof. I’d rather bike whenever I feel like it and have a bike stolen once every couple years rather than be constantly paranoid, taking extra precautions (such as opting not to bike). This ruins the experience of biking. Perhaps part of the Portland bike-theft-fear culture is related to the fact that many Portlanders have very expensive bikes. So, yeah, I’d be paranoid too if I spent thousands of dollars on a mode of transportation that could get stolen yearly. A moderately priced bike is more suitable for urban transportation as bike theft is a problem in all major cities. Last thought: There is such a thing as getting a bike insured. Some renter’s insurance will cover stolen bikes. I imagine there’s also home owner’s insurance or bicycle-specific insurance. At one point I had renter’s insurance and the company told me that the bike would be covered if it was stolen anywhere in the world. I could have taken the bike overseas and if it got stolen my renter’s insurance would have covered it. Maybe excessive media coverage is the source of my general angst over this or the partially dismantled bikes I routinely see at staples when I’m out and about or the general sense that my insurance company will screw me over when it comes to a claim (I have good homeowner’s insurance) or etc. I’m probably overly careful. Then again, I park my bike in my office when I’m at work and in my living room at home. I have a heavy duty ulock, so maybe I’m just being too paranoid about it. I’ve heard your concern about getting screwed over when filing a claim with the insurance company. There may be some truth to this. I’ve that in Denmark it’s a totally different story; the insurance is top notch and they replace stolen bikes for their customers as seamlessly as possible. It sounds like you rarely have the need (or desire) to lock up downtown. One thing I will say is that quick release wheels and seats will get stolen if not locked. Sometimes even bolted on wheels get stolen (all it takes is ten seconds of turning with a wrench). Therefore I recommend locking the wheels with a cable or u-lock. Alternatively, locking skewers can be purchased to replace the quick release skewer of the wheels and seat. It gives a lot of piece of mind. I also have my seat chained to my bike frame. Some bikes get stripped for parts in Portland, but believe me, it’s nowhere near as bad as it is in Washington, DC. The dynamic of media coverage and fear is something I think about a lot Gerald. I’m conflicted. If we don’t name problems and highlight them and get them attention than it’s very hard to create the political urgency to fix them. However, that increased attention itself can have negative impacts! I hear you. In this case, I hope people channel that fear into simply being more vigilant. I know about bike theft more intimately than 99.9% of the public because I have covered it and worked on the problem so much in my life. That doesn’t make me decide to not ride my bike or not lock it up downtown though – it only makes me more careful and smart about how I do it. For instance, there’s nothing a thief can grab off my bike. EVERYTHING is either taken off or bolted down. And I park in a high-visiblity location and always carry an extra lock if I’m worried at all about the location and/or just feel like I want a bit more peace of mind. Again. My daily bike is a custom-made rig that I have a lot of money and emotion tied to… And I park it on downtown streets all the time. When we stop using the blue staple racks, the thieves win. I’ m conflicted too. However, since moving to Portland I’ve become more anxious about having my bike stolen. This makes biking less enjoyable for me. There are very few cases in which I won’t actually ride my bike due to a fear of theft, but my hunch is that many others are biking less because of their fears. That’s what bothers me. I cringe every time my bike is left outside downtown, maybe its because I cycle through camps full of stolen bikes and bike parts on a daily basis. Where there is smoke, think fire. The event flyer wants participants to bring “a good attitude”. Does that mean being pleasant and informed, or does that mean being in agreement with the prevailing group-think of the evening? That means you can act and speak with whatever perspective you want… Just be nice and respectful of other people. Same policy as with this comment section. You don’t have to be informed, but you have to open up your brain so it can be filled with lots of information. I moderate the discussion and always try and make sure everyone has a chance to speak and/or ask questions. If you’ve ever been to Wonk Night you would know that we have had some heated discussions because very often not everyone agrees on the issues. Most ( all?) downtown parking garages have bike racks. No guarantees, but locking your bike in a garage instead of on the sidewalk reduces the opportunity for a casual thief since it’s more out of sight. That can cut the other way too. If your bike is ‘out of sight’ then so too is the thief inclined to fiddle with it.